A study of the European Union’s characteristic demographic, economic and strategic parameters shows that its status as a global player is diminishing compared with its great planetary peers. The EU’s slow-motion disappearing act is becoming increasingly hard to ignore, but are Europeans and their leaders really gauging the extent of the trend? For anyone considering the European Union’s influence in the world, it is important to distinguish between appearances and dynamics. With seven successive waves of expansion, the European community has significantly enlarged its footprint. At its inception in 1957, its six founding nations covered a total area of 1.3 million km2. By 1973, the European Economic Community (EEC) had embraced nine countries covering 1.7 million km2. The second, third and fourth extensions, in 1981, 1986 and 1995, increased the area — of what, in 1992, became the European Union — to 1.8, 2.3 and 3.2 million km2 respectively. Finally, the fifth, sixth and seven enlargements in 2004, 2007 and 2013 took these successive configurations to 3.9, 4.3 and 4.5 million km2 respectively Yves Doutriaux and Christian Lequesne, “Les institutions de l’Union européenne après la crise de l’euro”, coll. Réflexe Europe, La Documentation française, Paris, 2013, p. 44.. These figures amply demonstrate the magnetic power of the European Union, because the extension has been a peaceful process, accomplished with the consent of the populations who have joined… though also often with a lack of public debate and without referenda in the existing Member States. When ten new countries were invited to board in 2004, the European vessel stated to show unmistakable signs of “enlargement fatigue”. Since then, the economic and financial crises of 2008 have compounded these doubts, and the support of public opinion for the European project has been gradually thinning in some countries, as witnessed by the surge of Eurosceptic parties in the 2014 EU elections. Covering 4.5 million km2, the area of the 28-member Union (EU-28) is still far smaller than that of Russia, Canada, China, the USA, Brazil or Australia. The European Union is in fact currently 3.8 times smaller than Russia and half the size of the USA. Yet it is territorially – and politically – far more divided than these two countries, both organized along federal lines. In 1980, the EU-27 stood at an index of 113.5 compared with 146.6i.e. respective growth of 13.5 and 46.6% relative to 1960. worldwide. In 2000, these figures had moved on to 119.9 and 201.5 respectively. In other words, the world’s population doubled between 1960 and 2000 while Europe’s population in EU-27 had grown by less than 20%. 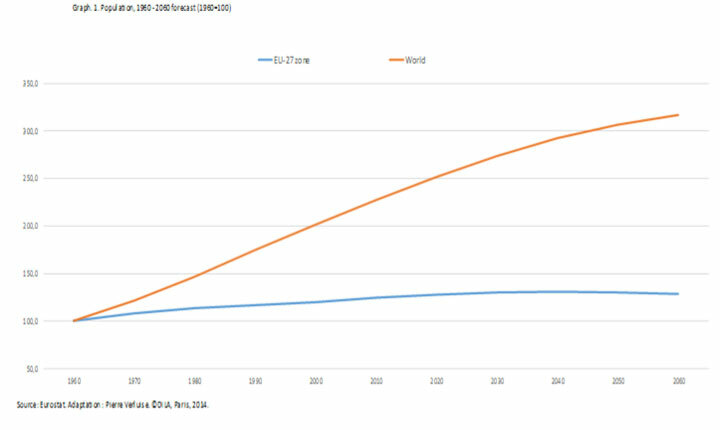 Mean projections for 2020 set EU-27 at 127.8 and the world at 252, then in 2040 at 130.6 and 292.1 respectively, and in 2060, at 128.4 and 316.5. While the world’s population is potentially trebling over a century, that of the EU-27 could reach a ceiling, with 30% growth over the same period. Even including all the official would-be members – with ageing population or decelerating demographyThis is the case in Turkey. See Gérard-François Dumont, “La Turquie et l’Union européenne : intégration, divergence ou complémentarité ?”, Géostratégiques, n° 30, 2011. –, the European Union has no chance of catching up with the world’s demographic growth rate. Through its series of seven enlargements, the European community’s population has increased mechanically. In 1957, the headcount of the six founding members was initially 163 million. The first enlargement took the Community to 240 million, the 2nd, 3rd and 4th waves to 260, 310 and 360 million respectively, then the 5th and 6th to 450 and 485 million respectively Ibidem, p. 44.. Since the 7th and latest enlargement, given the natural population growth in all member countries, the Union now has a population of 508 million, i.e. over half a billion, a figure that impresses, but that should not conceal two important limits. First and foremost, the European Union remains significantly less populated than the emerging Asian giants, China (1.36 billion people) and India (1.28 bn). Secondly, behind the rise in absolute population figures, lies a shrinking of the relative weight of the Union compared with the rest of the world. In reality, its total rate of growth remains very low relative to the world average, still essentially driven by the demographic growth of Asia, Latin America and, above all, Africa. The result is that the relative demographic weight of the European Union is on a constant slide For the purposes of continuity of comparison, we shall systematically refer to the current EU-28 area, even though all today’s Member states had not yet joined at those times, except where data is not available.. This can also be said for the USA, though to a lesser degree. While the relative demographic weight of the EU-28 was falling by 85% between 1960 and 2010, that of the USA fell by just 38% Source: United Nations Organization, World Population Prospects: The 2012 Revision. In other words the EU-28 is losing relative weight more than twice as fast as the USA. While the EU accounted for around 13.3% of the world population in 1960, this proportion had shrunk to scarcely more than 7.3% in 2013 and may barely exceed 5% by around 2050-2060. While it currently remains positive, the total demographic growth of the European Union is however slowing. It is expected to peak by 2045, before starting to fall. In 2050, the population of the EU-28 countries could be close to 517 million, while that of the planet could stand at around 9.7 billion Jean-Paul Sardon, “La géographie mondiale des populations en 2013”, Population et Avenir, n° 715, November-December 2013, p. 22 and p. 19.. This situation can be explained by several factors. While the world’s population has more than doubled since 1960, the European countries globally have, since the mid-1970s, seen their fertility rate fall well below the population replacement threshold. In 2013, the total fertility rate in the EU-28 only attained 1.6 children per woman when it should have topped 2.1. Put graphically, we are looking at an estimated shortfall of “0.5 children” per woman compared with the population replacement threshold in Europe. Not only has this “demographic winter” Gérard-François Dumont defines this expression thus: “the situation of a country in which fertility is significantly and lastingly below the population replacement threshold”.been producing cumulative effects for the last four decades, far from offsetting the trend, the enlargements since the start of the 21st century have in fact only consolidated it. Indeed, with the exception of Lithuania, all the countries that joined in 2004, 2007 and 2013 are currently posting fertility rates below the European Union average. In 2013, the population of the EU-28 had more seniors than young people, with only 16% of under-15s compared with 18% of people aged 65 or over – and 21% of seniors in Germany. What about the migratory influx? Since the early 1990s, the migratory balance has been the real engine room of total population growth across the EU, a fortiori because the immigrants are young and reproductive, since, to borrow Gérard-François Dumont’s observation, “migrating (happily) does not sterilize” Gérard-François Dumont, “L’étranger dans un monde globalisé : une réalité paradoxale”, Anthropologies du monde et pensée chrétienne. Quelles visions de l’homme aujourd’hui ?, Collège des Bernardins / Éditions Parole et Silence, 2009.. The 2008 crisis was however a watershed that is still overlooked by public debate. As from 2009, the migratory balance of the EU-28 zone fell from 1,411,471 to 851,335 While the figures published by Eurostat are precise,we should not allow this to mislead us. These are, in fact, estimations. It is important to focus on order of magnitude rather than on apparently precise figures.. According to still provisional data, the balance was estimated at 925,223 in 2010, 872,332 in 2011 and 653,100 in 2013 “First Population Estimates”, News Release, 108/2014, Eurostat, July 10 2014.. In other words, with no real change in migratory policies, the economic crisis substantially reduced the global migratory appeal of the European Union as a whole. This was notably the consequence of migratory patterns in southern European countries like Portugal and Spain, where the sagging economies caused a complete reversal of migratory trends, flipping these countries from strong immigration to emigration. Falling below the landmark threshold of one million per year should impact the demographic perspectives of the European Union and, consequently, its relative weight in the world. By halving the yield of its main engine, and with natural growth unable to do the rest, the crisis has again reinforced the demographic slowdown of the EU. In the short and medium terms, the European Union is set to remain the region with the world’s oldest population, a situation that will inevitably lead to issues for the funding of pensions, sub-replacement fertility and population decline NB: French demographers sometimes distinguish between “dépopulation”, when deaths outweigh births, and “dépeuplement”, a decline in the total population.in vast zones, tension between immigration and social inclusion, notably with the question of diasporas Gérard-François Dumont, Démographie politique. Les lois de la géopolitique des populations, Ellipses, Paris, 2007.. China, where the ageing process is already under way, will, according to the UN’s mean demographic forecast, account for 19.1% of the world population in 2015, but only 14.5% in 2050, a date by which Africa will have around 2.4 billion people, i.e. 25.1% of the world population. 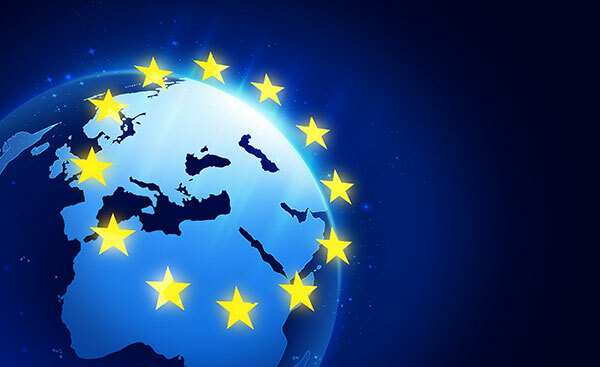 The European Union forms the world’s biggest domestic market. In 2013, its gross domestic product (GDP) in purchasing power parity (PPP), which had grown mechanically as a result of enlargements, reached €13,067 bn, ahead of the world’s two other main economic powerhouses: the USA and Japan that attained respectively €12,517 bn and €3,476 bn Source: Banque de France, “Zone euro. Principaux indicateurs économiques et financiers”, December 24 2014.. According to the World Bank, China clocked up €12,203 bn. The EU, moreover, remains an economic magnet, drawing more direct foreign investment than any other region. The last three enlargements have, nonetheless, been beneficial to new member countries that had most often been subjected to four decades of planned economies followed by a difficult transition to the market economy. On January 1, 2004, the GDP of the ten countries in the process of preparing to join on the following May 1 accounted for only 4.7% of the GDP of the EU-25 zone, i.e. a far more modest share than that of their demographic weight (16.2%) Pierre Verluise, Fondamentaux de l’Union européenne. Démographie, économie, géopolitique, Ellipses, Paris, 2008, p. 115 and p. 47.. True, these enlargements are part of the new geopolitics of geographical Europe Geographical Europe notably includes Russia and former Soviet Republics such as Ukraine and Moldova., but it is hard to get public opinion to swallow the idea that, when the EU is joined by countries that are poorer than its average, it comes out enriched. Especially when figures actually prove the opposite. In 2008, the GDP per capita in PPP across EU-25 was still 11.4% lower than that of the ex-EU-15 Pierre Verluise, Fondamentaux de l’Union européenne. Démographie, économie, géopolitique, Ellipses, Paris, 2008, p. 117.. The already substantial gap between the EU and the USA is growing just as steadily. In 2013, the GDP per capita of the EU-28 in PPP stood at €25,710 compared with €39,550 in the USA and €27,310 in Japan. In 2014, no country to have joined since 2004 has become richer than the average for EU-28 In a context of economic crisis that has been ongoing since 2008, most of the new members have been closing in on the EU’s mean GDP per capita. Pierre Verluise, “UE-27 Crise mais rattrapage des Nouveaux États membres ?”, Diploweb.com, November 18 2012..
A more dynamic perspective also reveals that the economic weight of the EU-28 zone in the global economy is also diminishing (see Graph 2). 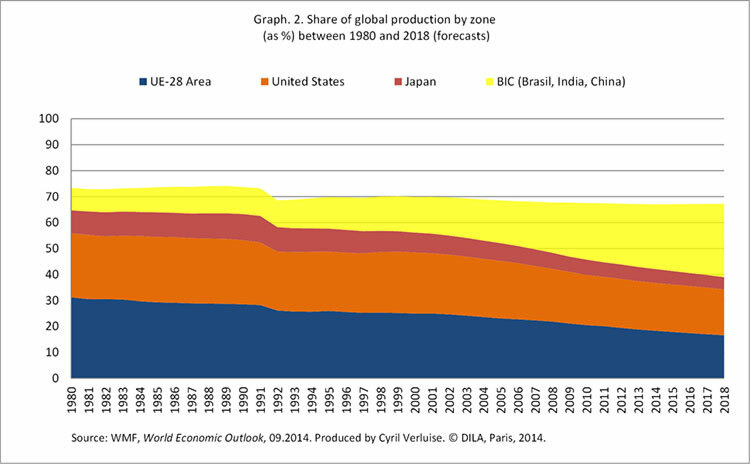 Between 1980 and 2014, the share of the EU-28 zone in worldwide production, measured in PPP, fell from 31.2% to 18.3%, meaning that the relative status of the EU-28 zone is now less than two thirds of what it was 34 years earlier. True, this trend is part of the broader relative fall in influence of the developed countries, faced with the surge of the emerging countries. This pattern has however hit the USA less hard than the EU and Japan. In fact, according to World Monetary Fund (WMF) projections, in 2018, the USA could weigh in with a 17.7% contribution to global production, compared with just 16.6% for EU-28. If this does materialize, the EU-28 zone would lose its status as the world’s leading domestic market. In 2018, according to the World Bank, China accounted for 18% of global production in PPP. Perspectives have become even gloomier if we factor in the two key parameters of production: capital and labor. 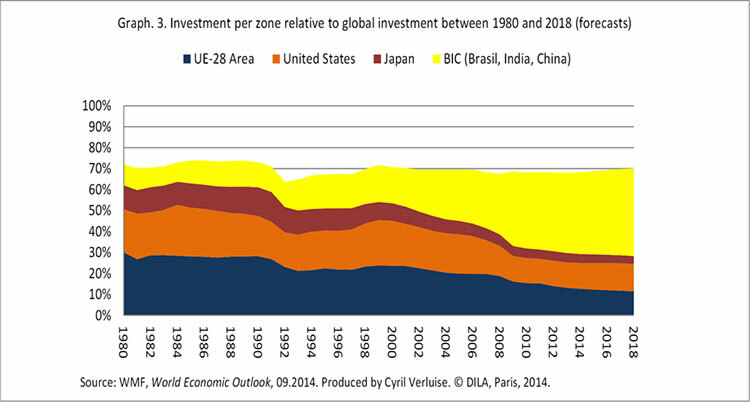 Firstly, the EU’s share of global investment has been in constant decline since 1980 (see graph 3). Where the EU-28 zone used to account for 30.1% of global investment, this share had slipped to just 12.7% in 2014. This indicator has thus been on a steeper downward curve than global production. Over the same period, the USA has slipped from 20.6% to 12.3%, a far less emphatic trend than the EU zone. Compared to this, the Brazil – India – China (BIC) group has risen from 9.9% to 39%, i.e. a fourfold increase in share, far higher than the growth of the relative weight of these nations in the global economy. Confirming the trend, forecasts for 2018 set the EU-28 at 11.5%, the United States at 13.0% and the BIC at 41.9%. Secondly, the labor factor is evolving differently depending on the zones considered (see Graph 4). Since 2000, unemployment within Europe has never fallen below the 7% mark. It averaged nearly 9% over the 2000 – 2013 period, compared with 6.4% for the USA and 4.7% for Japan. Even in a period of economic growth, the EU is the region in the world that has had the hardest time reversing the unemployment trend. The pattern of mass unemployment wedded to long-term unemployment that seems to becoming part of the European landscape raises the specter of part of Europe’s working population becoming barely employable, thus durably affecting the productive capacity of the zone. This therefore leads to a combination in which not only is the EU’s share of global production in decline, but the current and prospective status of the two key production factors are such that this dynamic is likely to worsen still further. True, in 2014, one could read the following on the European External Action Service Web site: “Since the creation in March 2002 of the European Union Police Mission in Bosnia and Herzegovina by Council Joint Action, some 30 civilian and military missions and operations have been launched under the CSDP [Common Security and Defence Policy].” European External Action Service (EEAS). Consulted on August 26, 2014.The method consisting in bundling together in an announcement missions of very disparate kinds leads the public to over-estimate the number of military operations actually carried out by the European Union, when in fact there have been only nine since 2003. Even here, the European Union’s military operations are generally joint efforts with the North Atlantic Treaty Organization (NATO) or the United Nations (UN), suggesting a very controlled conception of force that carries a risk of paralysis. Hence, concocted by the European Union as a means of intervening in Libya in 2011, the EUFOR-Libya operation failed for want of the UN’s green light. Meanwhile, powers such as the USA and Russia periodically use force without such niceties. In terms of European troop deployment, the EU’s engagement in military operations remains lightweight, ranging from 400 to 7,000 depending on mission and period, far below the goal of 60,000 announced in 1999 at the European Council in Helsinki. Currently, the European Union’s military missions lack human and technical resources, but, above all, political willpower. Since 2009, the EU has of course had the EEAS, led by a High Representative of the Union for Foreign affairs and Security Policy. Yet the treaties have established a very strict framework for the Representative’s attributions, preventing her from straying on to the sovereign prerogatives of the member countries Pierre Verluise, The Geopolitics of the EU Borders. Where Should Expansion Stop?, ESKA Publishing, Paris, 2014 (see Chapter 3: “What is the European External Action Service?”).. The Heads of State have even been suspected of having chosen, as the first holder of the title, Catherine Ashton, a British political figure with no diplomatic experience, precisely to prevent her from staking out too much territory. The result is that the first three years of her tenure failed to impress. However, two initiatives in 2013 drew a more positive perception: firstly surrounding Serbia/Kosovo relations and secondly the relaunch of negotiations with Iran It is still too early to judge the capacities of the new incumbent, Federica Mogherini, who has only occupied the position since November 1 2014.. True, 22 of the 28 European Union member states are also members of the world’s leading strategic alliance, NATO. The latter, bolstered by the 1999, 2004 and 2009 enlargements, taking in former members of the Warsaw Pact, is deemed to have won the Cold War and its lukewarm aftermath. However, the structural relations between the European Union and the Strategic Alliance Charlotte Bezamat-Mantes and Pierre Verluise, “UE-OTAN : quels rapports ? Les élargissements de l’OTAN donnent le rythme de ceux de l’UE”, Diploweb.com, June 7 2014.are both guarantee of security and a comfort zone that prevents the former from raising its own profile in the strategic arena. Under the Maastricht and Lisbon Treaties, firstly Common Foreign Security Policy (CFSP), then European Security and Defence Policy (ESDP), and finally Common Security and Defence Policy (CSDP) have been all but placed under the trusteeship of the Atlantic Alliance. The European Union is indeed bound to comply with undertakings derived from the North Atlantic Treaty which, for its member states, “remains the foundation of their collective defense and the forum for its implementation” Treaty on European Union (TEU), Article 42, paragraph 7.1.. Taken literally, this wording with the emphasis on the singular, could proscribe any European defense initiative. For all this, the strategic constraints that weigh the most heavily on the European Union are psychological. In the aftermath of two World Wars, Europe was rebuilt on the basis of saying goodbye to military power, firstly between member countries, then with respect to the world in general. By aspiring to a form of “unending peace” between its members, the EU recast itself as a soft power, and certainly not a hard power. Consequently it long refused to conceive of the planet as countries do, namely by identifying enemies and defining a true strategy. The European Union has at its core a form of voluntary renunciation of all power-based politics. Ontologically, it has no real desire for power. Promoting an ambiguous multilateralism provides an alibi for this strong tendency to impotency. When a conflict arises on its borders, the European Union generally starts its response in interminable discussions before belatedly producing a statement that is usually reduced to the lowest common denominator. Some generally hope that Washington will find a way to step in by proxy, while others, more proactive, look around desperately for something or someone else to rely on. – including Germany with 1.1% – the proportion lies between 1 and 1.5%. All the other member countries spend less than 1% of GDP on defense. European industries are increasingly turning away from the manufacture of weaponry in favor of civilian products, at the risk of losing knowhow and expert processes. If the trend continues, the EU member countries will be increasingly reduced to buying off-the-shelf N-1 equipment from the USA. This, to some extent, would not displease the US military-industrial complex. If the United Kingdom decided to pull out of the EU, a scenario frequently mooted by observers, which countries could France turn to for support in reviving for the nth time the idea of a common European defense? The question is of increasing concern as the USA has decided to turn its attention to Asia, while the Ukrainian borders have been threatened and violated several times by Russia since 2014. Paradoxically, over the last year, tensions with Russia have produced an “upside” by inviting the EU member countries to undertake to step up the share of their GDP devoted to defense over the coming years. What this will actually deliver remains to be seen over the next few years. There is no getting away from the fact that the European Union is a fading force in the international arena. Demographic, economic and strategic indicators all point to a decline in profile. More disturbingly, this ongoing process is speeding up in the wake of the crisis initiated in 2008. Have the new heads of the European institutions named in 2014 realized the extent of the trend and will they come up with initiatives to – if not reverse – at least limit a pattern that is not helpful to the European Union… or to Europeans?